This walkthrough guide is specifically using the current latest version of the NetApp Simulator ONTAP – version 8.1, and running the lab inside VMware Workstation 8 (*see Appendix B for Simulate ONTAP 8.1 Hardware and Software Requirements.) 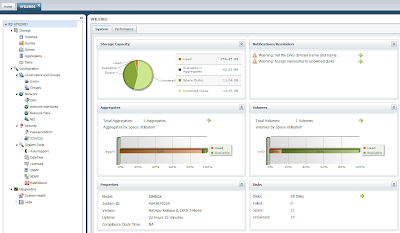 The NetApp Simulator is an excellent tool to learn about NetApp filers in a virtual lab environment. 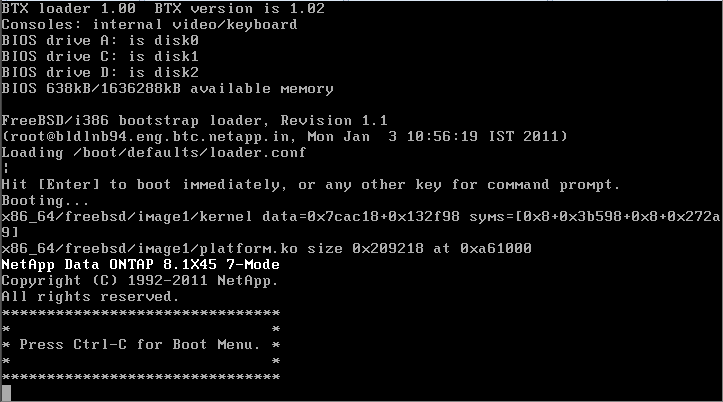 Go to http://now.netapp.com/NOW/cgi-bin/simulator and login with your NetApp NOW account. Extract the downloaded zip files – vsim-7m.zip and vsim-cm1.zip – to their respective folders. Note: Whilst we are downloading software, go to https://now.netapp.com/NOW/cgi-bin/software/ and download the OnCommand System Manager (latest version at 7th December 2012 is 2.0R1 which supports ONTAP 7.3.2 and above.) 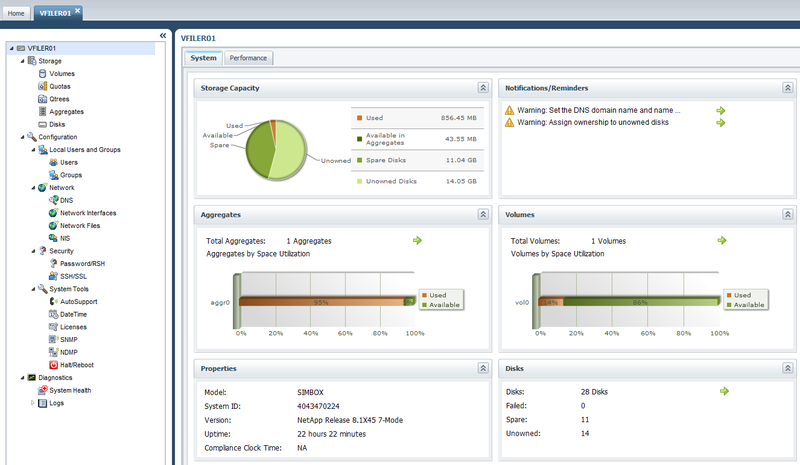 The OnCommand System Manager provides a GUI to manage NetApp Filers. The file name for the Windows version is sysmgr-setup-2-0R1-win.exe . Screen Ouput: The administration host is given root access to the filer's /etc files for system administration. 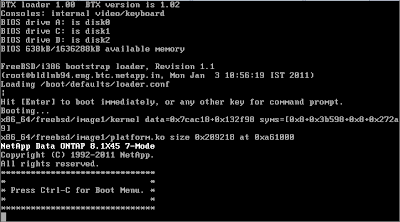 To allow /etc root access to all NFS clients enter RETURN below. Then wait for the network interface to become pingable and the system to complete its initialization. Feel free to play around with the simulator to your heart's content! Data Ontap 7-mode (or classic mode) allows FAS arrays to be deployed as a local two-node cluster, a geographically spanned MetroCluster, and as a remote distributed FlexCache, which enables capabilities like LDVM for VMware. Data Ontap C-Mode (or cluster mode) expands a NetApp storage cluster from 2 nodes to 24 nodes, increases the features found in 7-mode to include endless scaling, global name spaces, and the complete separation of data and data access from the hardware layer in the form of next generation vFilers (known as vServers). I have a guest NOW account, can not download the simulator, can i download it from someware else? The simulator is only available to NetApp partners. I'd check for it on the net at say www.4shared.com, www.filestube.com, or a torrent site - it should be out there. Please let me know if you cannot find it. thanks a lot for that tip, I'm currently doing that disk clean now, but it's taking ages... any idea, why this couldnt have been done in the source image itself? Looks like 2 seperate nodes no CF? Thanks for this Vidad. Any idea how a non-NetApp partner can get hold of a demo license for OnCommand. Thanks a lot, this is very much useful for a beginner like me. Can you please share about the fundamentals of Netapp. How can I get "NetApp OnCommand System Manager"? Hello Vidad, is it possible to simulate 7-mode HA pair? i have installed netapp Siulator on Work station. but, how can i open it from Windos which is installed on same work station.